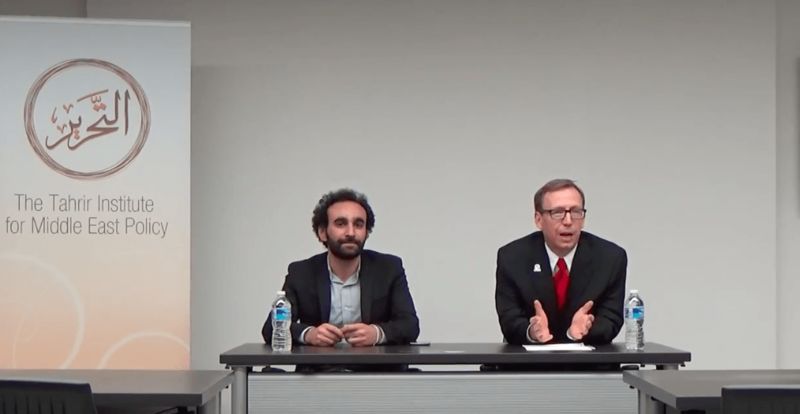 On December 17, 2015, the Tahrir Institute for Middle East Policy (TIMEP) hosted an event entitled “The Quandary of the Egyptian Revolutionary Camp.” The event featured TIMEP’s inaugural TIMEP-Atlas Corps Bassem Sabry Democracy Fellow, Mohamad Adam, in a discussion with founder and CEO of Atlas Corps Scott Beale on the current dilemma of Egypt’s revolutionaries from 2011. Mr. Adam reflected on his personal experiences as a revolutionary and spoke to the challenges he faced in addressing this dilemma within the context of international policymaking. More specifically, he shared details of his fellowship experiences and analysis of the gap between local dynamics and the perception of the Middle East held by policy professionals in Washington, DC. The audience raised questions about what Egyptian revolutionaries have learned and how they can better influence change in accordance with the aims of the 2011 revolution. Other questions centered on Mr. Adam’s perspective about the potential for social upheaval to occur in the future.